Perfect for take-out restaurants, stadiums, outdoor barbecues, and more, these Choice medium weight individually wrapped white plastic teaspoons will exceed your serving needs! Wrapped in a clear poly wrapper, each teaspoon is shielded from contaminants, maintaining its sanitation during storage and transport. Complete your plastic cutlery settings, or use them to fill your flatware bins at your snack shack or concession stand for easy take-out or grab-and-go applications. Made of durable polypropylene, these disposable teaspoons are strong enough to last through your meal service, and can be easily disposed of, making cleanup a breeze. These spoons are very good lightweight spoons. They are individually wrapped and work very well for our soft serve ice cream. We will continue to buy these for our business. I purchased these spoons for the 1st time and was very skeptic and when they arrived they turned our to be very firm not on the flimsy side. For the price the quality is good. Customer has switched to these and are very happy with them. Inexpensive spoon that employees use for coffee, lunch or any other items. Saved some money too. For the price they are good. They work well with jello, yogurt and ice cream but would have to be more careful with heavier foods. But having them individually wrapped helps alot. Very good quality spoons and i received my items on time. I would recommend to purchase this product. i will be reordering again very soon. Good quality for light meals such as soup and yogurt. Would not recommend for heavy items such as Ice cream or sides. Will buy again. Affordable spoons we buy a ton of these for our customers at our deli very sturdy spoons not like the bad plastic that breaks these are the best! Great for light duty applications. Not heavy duty but it works ok for light weight items, salads, etc. Not meant for heavy use. I like the fact that it's plastic wrapped though. I use these for outdoor events where I want to keep everything clean. item is ok, a little stronger would have been better. They will be used for yogurt and soft foods so they should hold up fine. We chose these lighter weight spoons in individual packing to give out with our powdered ice cream we make on our catering jobs. The spoons will honestly not work well for harder food you need to "Dig" into or cut but with light foods and stuff that just needs to be scooped up these are perfect, allowing a nice low price for a bulk buy. The individual wrapping gives appeal when being given out to customers for a peace of mind and sense of cleanliness. Used with our ice cream cart when selling/giving away homemade ice cream. Quite weak. Customers often complain that the spoons bend too much. On the other hand they have a very low price and they don't break, just bend. Compact packaging. I would re-buy them. Love these spoons. They were exactly what I was looking for and they work perfect in my shop. I love that they are protected by the wrapper. Good for foods that don't require much pressure since they do bend pretty easily, but I guess you pay for what you get. Nice that they come so many in a case. We have used Sporks for the last 3 years and finally we decided to go back to the original. This is a great price for a spoon and it works far better than a spork. shipped quickly (as always with this website) and of course are perfectly usable. Easy to open and packaged very well. I would recommend this product. I wouldn't quite say medium weight... I would rather say light weight. However they work well with what I was needing them for... I will purchase again! The price is reasonable. I use this individually wrapped plastic spoon for ice cream. The size is just good for my usage. It's doesn't break easily. I like how the teaspoon is in a plastic wrapper where it can be handle easily. The teaspoon itself is a little small and flimsy. I would suggest going with a heavy duty weight. Excellent Individually wrapped spoons for serving with my Italian Ice. No need to worry about contamination or the spread of germs with these Individually Wrapped Spoons. Great spoons for the price. The handle could be a bit stronger for my taste, but works very well when surving yogurt parfait so or similar. We use these spoons for our snocone. they are packed very tightly. The plastic wrapper is very sturdy and have to help little children open but this keeps them sanitary. Liked the idea of individual wrapped spoons and ordered these for the first time. They arrived quicker than I expected and the individual wrappers are nice. The quality of the spoons is unfortunate. If you need to exert any pressure on the spoon, they bend too easy. Whatever you are serving would need to be extremely soft and light to use these. Considering the other reviews, maybe my box was defective? Thank you for the review! We're sorry these did not work for you. They are a very economical option, perfect for light duty tasks. We recommend trying these Visions Individually Wrapped White Heavy Weight Plastic Teaspoons instead. Hello I'd like to take the time today to do a review on a product from an online store called Webstuaunt. I purchased a case of spoons for customers eating ready to eat foods. So far so good. The spoons are not the best quality endurance wise, but they do the job and are not very expensive. I like that they are individually wrapped and super convenient. These spoons are good for basic spoon needs. They do bend quite easy but they will work good for soup and other lighter foods. Still a good value. These spoons are great to keep on hand for "To-Go" orders and for catering orders. I don't order these very often but have always been highly satisfied with them. These worked perfect for our employees. We like these a lot better because they are actual spoons and not big soup spoons. Would highly recommend. received the item in a timely matter, this is a high quality product, good cost effective way for restaurant owners, will purchase again if needed. we use these prewrapped spoons for our to-go menu items, very simple, yet effective item to add to your go orders....and the price is right. These spoons are sturdy and work well. Our customers like that each one is individually wrapped, so they know that no unclean hands have touched their utensil. Good quality spoons, always in stock and the best price I was able to find on the internet. I like that they are individually wrapped. These individually wrapped plastic spoons, were a great idea to order. The guests had opportunity to open and use them. The guests did not feel that cheap spoons were used and it was hygienic too. Value for our money. these white plastic spoons are a very good price. Well made, and they are perfect for our business. We dont have to worry about children with them. 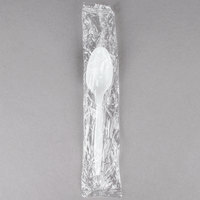 These are great individually wrapped spoons that are good for offering with all sorts of to go items! Nice for ice cream because they are strong enough not to break during using them!!! We use these prewrapped spoons for our take-out ice cream customers. Customers like the fact that the spoons are pre-wrapped and seem to be sturdy. Very Good product! Does not break while eating. Medium weight is perfect for us. Have not had one complaint from any employee's and we have been using these for over 6 months.